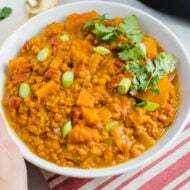 Not your average chili, this butternut squash and turkey chili features red lentils and is simmered in a creamy coconut milk and tomato broth. Make this in your pressure cooker or on the stove top! Isaac’s brother got us the Power Pressure Cooker XL for Hanukkah and I was so excited because I’ve been wanting an Instant Pot and the Power Pressure Cooker XL is really similar. Over the past month or so I’ve been testing it out and now I’m basically hooked on cooking everything in it— rice, beans, soups, shredded chicken. It can cook just about anything. Plus, you can make a flavorful chili that tastes like it’s been cooking all day in about 20 minutes… it’s amazing!! The butternut squash and turkey chili I’m sharing today is the first recipe we made in the pressure cooker after and it sealed the deal! I was so impressed with how quickly the chili cooked, the texture and the flavor. I was worried the pressure cooker would totally overcook the chili and turn the ingredients into mush, but it actually cooked everything perfectly. The butternut squash chunks were tender, but still held their shape. I have to admit that I am kind of using the term chili at my own liberty as this recipe might technically be more of a soup or stew, but it does have chili powder, cumin and tomatoes so it totally counts as chili in my book. It also has turmeric and coconut milk, which honestly makes it taste better than traditional chili, in my opinion. In terms of serving, don’t skimp on the kale, cilantro and green onion. These items are added after the cooking and give the chili a pop of color and add a ton of fresh flavor! 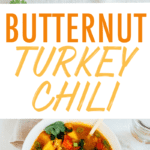 Even if you don’t have a pressure cooker, I hope you give this butternut squash and turkey chili a try. It’s our new favorite winter meal over here! 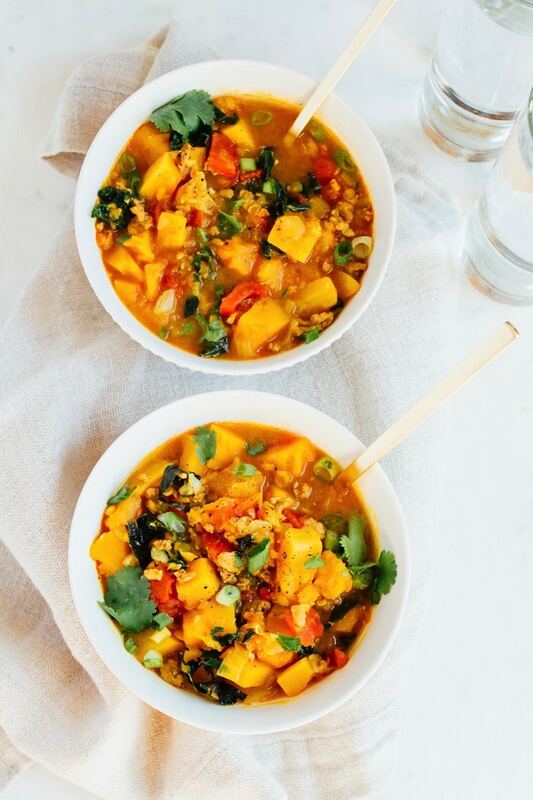 The butternut squash and turkey paired with red lentils and kale make for a hearty meal that’s so warming and comforting — perfect for chilly evenings. 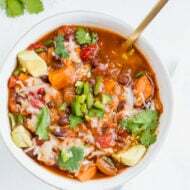 Not your average chili, this butternut squash and turkey chili used red lentils and is simmered in a flavorful coconut milk and tomato broth. Make this in your pressure cooker or on the stove top! Push the sauté/browning/meat button on your pressure cooker. Add oil to the inner pot. Sauté onion and garlic for 3-5 minutes. Add ground turkey and cook until brown, about 5-7 minutes. Use a wooden spoon to break up the meat while cooking. Add spices (turmeric, cumin, chili powder, cayenne pepper, cinnamon, sea salt and pepper) and cook for an additional minute. Add butternut squash chunks, veggie broth, tomatoes, coconut milk, lentils, tomato paste and apple cider vinegar to the pot. Place the lid on the pressure cooker, lock lid and make sure the pressure release valve is closed. Press cancel on the pressure cooker and then press the soup/stew button. The timer should be set to 15-20 minutes. Once the timer reaches 0, the cooker will switch to keep warm. Carefully switch the pressure release valve to open (I use tongs for this). 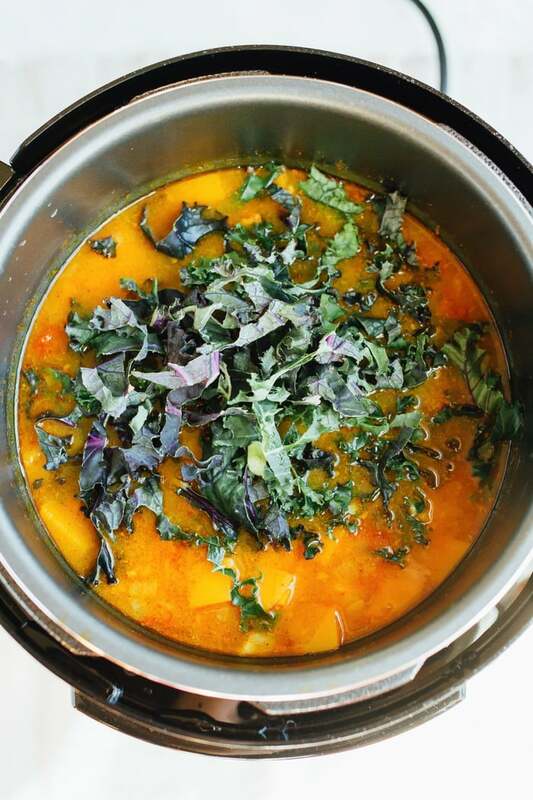 Once the steam is released, remove the lid and add in chopped kale or spinach. Give the chili a stir and let sit for a couple minutes to allow the greens to wilt. Portion chili into bowls, top each bowl with fresh cilantro and green onions before serving. You can also serve the chili over brown rice if you’d like. Add oil to a large pot over medium heat. Add onion and garlic and sauté for 3-5 minutes. Add butternut squash chunks, veggie broth, tomatoes, coconut milk, red lentils, tomato paste and apple cider vinegar to the pot. Stir to combine. Bring mixture to a boil. Once bubbling, reduce heat to medium and simmer the chili uncovered for about 30-35 minutes, stirring occasionally. 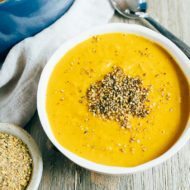 Once the butternut squash is fork-tender and the lentils are cooked, reduce heat to low. Add in kale or spinach, stir to combine and let sit for a couple minutes to allow the greens to wilt. If you’re serving a crowd or just want to extend the servings of the chili you can serve it over brown rice or quinoa. We did this one night and it was delicious! Inspired and adapted from Oh She Glows. This looks incredible, and as far as I’m concerned, it’s a chili. 😉 I love the addition of coconut milk and turmeric! Do you think this would work as a vegetarian/vegan dish without the turkey? It looks so delicious! I need a new recipe for my pressure cooker and this looks perfect! 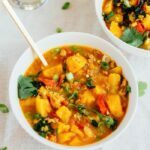 I really love the addition of butternut squash in a chili, whether it is a vegetarian-style chili or one with poultry, etc. I’m also curious about a pressure cooker. I’ve seen one demonstrated on TV before and it looks so multi-faceted! It’s my goal to buy one sometime soon. Ohhhh I bet this chili is so comforting and filling! I’m obsessed with the fact that it has butternut squash in it, my fave! It should taste in a different way because of this number of ingredients. It looks like Indian recipe. Anyway thanks for sharing Brittany. this looks SO delicious! and I really need to get an IP or pressure cooker. Coconut milk?! Yes! That sounds fantastic. So many tasty ingredients in here. This sounds just delicious! 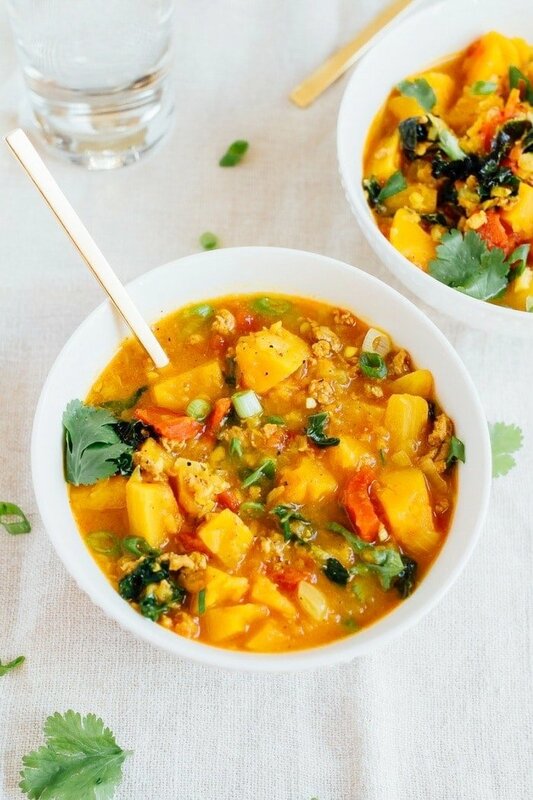 I’m a huge butternut squash fan, I love that you’ve used it in chili! oooo i def need to try this in my IP!!! Please do!! I can’t wait to hear what you think of it. Yum! Do you know about how many cups are in each serving? I just made this. I used red beans because I had no lentils. Very very delicious! Love the coconut milk in it. I’ll make this often! Thanks for much for this recipe! Wow this one looks really delicious and warm, perfect for the snowy days here in New York! I happen to have an pressure cooker, will try it out during the coming weekend! So would one serving be about 1/2 a cup ? Wow! This is so delicious. I added a little more heat with some extra chili powder and hot sauce at the end. I also thickened it a little by mashing some of the squash on the side of the pot and stirring into the rest of the soup. Even better the next day when the the flavors have had some time to meld together. Will definitely make again! Saw this through a link from Self. I used random squashes that I had stored in the basement (can’t remember what kind, but not Butternut) and it is fabulous. Thank you! Ahh!!! This makes me so happy to hear. So glad you found me AND so glad you liked the chili. Could this be done In a crockpot? This was the best soup I have ever made…and I make some mean homemade soups! I used three different kinds of squash and an eggplant. I couldn’t find red lentils, so I just used regular ones. Absolutely delicious! On my way over to give my neighbor some (it was made with the squashes from their garden). Can’t wait for them to taste it! Thanks for such a great recipe! Looks awesome can what can I substitute for the coconut milk? The coconut milk is essential to the recipe and makes the chili super creamy and so delicious. I wouldn’t recommend substituting it. does the coconut milk separate when added at the beginning? 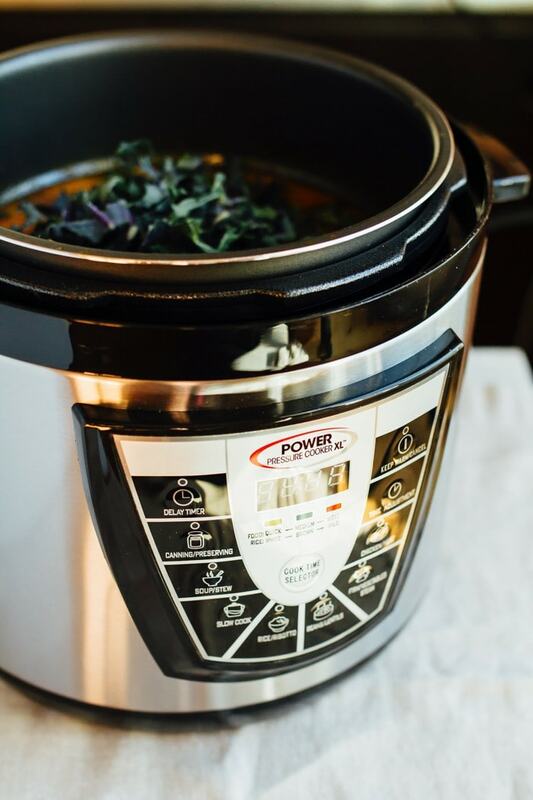 i have seen other IP recipes where you add coconut milk at the end after pressure cooking. Hi Helen. No, I haven’t found that the coconut milk separates. Just made this tonight. It’s my second time using the Intant Pot. So delicious!